Fully-staffed downtown villa: indoor/outdoor living at its best. Great location! SMA's most photographed home and one of the most picturesque. N.B. Please see our video tour in the slideshow . Casa Piña SMA is one of San Miguel de Allende’s finest colonial homes furnished with period antiques and original artwork. This three-bedroom and four-bathroom downtown villa sleeps up to six guests and is attended to by a courteous, diligent and trustworthy staff that provide personalized service for guests and the luxury of total leisure. Casa Piña SMA’s front door is just half a block from the center of town, offers unparalleled access to the idilic life of el Jardin and convenient strolls to all points beyond in the centro historico. Yet behind the thick adobe walls of its original facade guests will experience a rare form of peace, privacy and privilege. Casa Piña SMA’s focal point is the central patio with a large stone fountain in the middle. The south-facing “outdoor” living room and dining room is a year-round favourite with all guests. It fills with warm winter sunlight and remains cool and shady in the summer as the sun travels further north. It is a lovely spot to spend the entire day, to entertain or host a comida with guests. Another table in the cactus garden at the rear of the house provides an al-fresco dining option. At sunset, the rooftop mirador is the best spot in the house to start the evening in style or to reflect on the day’s events as the sky lights up in a colourful display and sun disappears behind the distant mountains. The third bedroom sits atop the the second bedroom but is a full story up from the master bedroom suite. It has a has a Queen-sized bed, bathroom with shower, and a comfortable terrace overlooking the central patio. Guests seeking higher ground will find it along with stunning views up the spiral staircase to the rooftop mirador, or lookout. At Casa Piña SMA, everything is provided to enable you and your Lfamily and friends to enjoy a pampered vacation. Master bedroom 1st ensuite bathroom. Master bedroom 2nd ensuite bathroom. 2 Bathrooms in the Master bedroom. Ensuite bathrooms in both guest rooms. Casa Piña SMA has an unbeatable location in San Miguel de Allende's Centro Historico, just one block from the central square. Overlook the city's landscape from it's core. In the blocks around Casa Piña SMA, life continues largely as it previously was, grab a sombrero and act the part of a caballero or dama form the Golden Age of Mexican Cinema. Mexican landline for local calling plus a VoIP line for free long distance calling to USA and Canada. Living areas have wood burning fireplaces. Gas fire-places in every bedroom. Electric blankets available. Housekeeper provides fresh and crisp bed linens and changes them as needed. Housekeeper does all the laundry including linens, towels and personal items. Wood-burning fireplaces in both living rooms. Gas fireplaces in all three bedrooms. Secure indoor parking is available upon request. Space for one vehicle. Indoor garage is part of the property. Staff help with doors and entering and exiting. Housekeeper provides fresh and fluffy towels and cleans and changes them as needed. There are two: an outoor living room/dining room as well as an indoor living room/dining room. The cook takes care of clearing and washing the dishes from breakfast, lunch and any dishes that accumulate overnight should guests wish to eat in. Whirlpool. Gas oven with an electric broiler. Philco. Goes "ping" when timer is done. Drip coffee maker. Filters provided. There is also a Chemex Classic CM-8A with Chemex filters. Traditional earthenware plates from Tlaquepaque, Jalisco. A wide variety of hand-blown bubble glassware. Actual silverware. Cloth napkins. Everything for a formal dinner setting, if desired. Chef's kitchen with Whirlpool fridge and gas stove with five burners and an oven, tons of counter space and a extra deep double sink in ceramic. Flat screen TV, 32" with extensive cable package, including many English channels. Four portable Ultimate Ears Bluetooth speakers, one stationed in main living area and one in each of the three bedrooms. The four can be networked together. Many books, from coffee table books on pre-Columbian civilizations, to local travel guides to harlequin pulp. BYOD for streaming on Bluetooth speakers. Each room has a private terrace and access to other outdoor areas, like rooftop lookout with seating and a king-sized hammock or the cactus garden on the ground floor at the back. The house is organized around a spacious outdoor patio with a stone fountain and features many outdoor areas. Indoor outdoor living at its best. A central courtyard provides the circulation to the different living areas and several flights of outdoor stairways that lead to the bedrooms. At Casa Piña SMA, everything is provided to enable you and your family and friends to enjoy a pampered vacation. READ ON! This spacious and comfortable home is staffed by a full-time cook who shops and prepares local delicacies, as well as a houskeeper/laundress, six days per week. A gardener comes in twice-a-week to tend the banks of flowering plants and vines that grace the patios, walkways, sitting areas, and terraces. In addition, there is an English-speaking property manager on-call at all times just in case. 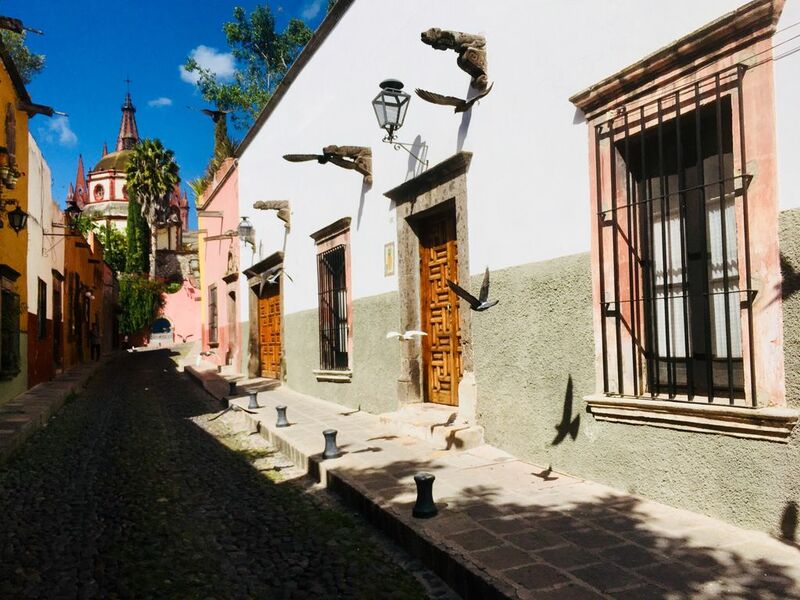 Casa Piña SMA is at the beginning of Aldama, a picturesque, cobblestone, residential street that leads away from the back wall of San Miguel's main church located on the town's central square. The chic restaurants, bars and rooftop terraces are a just steps away. So is Parque Benito Juarez, San Miguel's Central Park, if you will. El Centro Historico is at your doorstep, everything's within walking distance-- really.